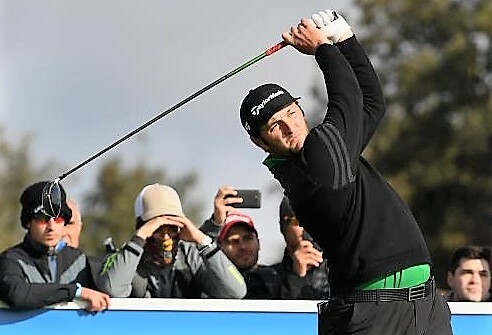 World Number Four Jon Rahm is just one shot off the pace after Irishman Paul Dunne and Scot Marc Warren both produced big finishes to sit atop a congested leaderboard after day one of the Open de España (Spanish Open). Warren birdied five of his last seven holes to sign for a 66 and get to six under and it looked like he would lead on his own as heavy rain moved in during the late afternoon at Centro Nacional de Golf. The conditions proved no problem for Dunne, however, as he finished with an eagle to join Warren (pictured right) at the top with a one-shot lead over a group of 11 players. Rahm, who finished fourth at the Masters Tournament last week, and amateur Victor Pastor delighted the home crowds at five under alongside English trio Aaron Rai, Callum Shinkwin and Jonathan Thomson, Swedish pair Alexander Björk and Henric Sturehed, Frenchman Julien Guerrier, Australian Jason Norris, Austrian Matthias Schwab and South African Erik van Rooyen. Defending champion Andrew Johnston was then in the group at four under, with 40 players within three shots of the lead. Local favourites Nacho Elvira and Pedro Oriol, South African pair Trevor Fisher Jnr and Richard Sterne, German Sebastian Heisele, Dane Thorbjørn Olesen, Australian Brett Rumford and fellow Englishman Paul Waring were alongside Johnston two off the lead. 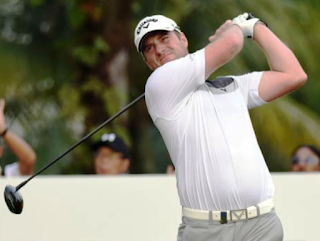 Paul Lawrie struggled to a 76 and needs a very good second round if he is to beat the cut. The Aberdonian has only four or five players with poorer scores behind him on the scoreboard. Starting at the 10th, Paul bogeyed the 12th and had double bogeys at the short 14th and the par-5 18 so that his first nine holes cost him 41 blows. He started his second nine well with birdies at the long first, short third and long fifth with only a bogey at the second in that good run. He dropped another shot he could ill afford at the ninth but still covered his second nine in one-under 35. Jon Rahm: "It feels great. To be honest, I would have taken anything under par, given the fact that I played a lot better than I expected to play. My long game was amazing. The driver alone set up two birdies on 13 when I hit it over the green and on seven, where I got it right up to the green so things like that are a bonus. Hopefully I can keep hitting it tee-to-green the same way and make a few more putts the rest of the week. “They did a fantastic job drying the course. On the first hole especially after yesterday I was expecting the ball to land and stop but it took a big bounce. It was amazing to be able to dry up the course the way they did, that’s why the scores are not as low as we expected. "On the par fives even, if I had a seven iron I couldn’t have stopped it on the green, you are not going to be able to hit it really close, same on five. So all credit to maintenance, it was amazing to see how good a job they’ve done. “That bogey on 17 was unexpected because I hit three great shots and still made a bogey. Great tee shot where I wanted to hit it just a bit too long, good chip a little too far to six feet, and the putt was good but it lipped. Everything balances out in golf at some point, and I got lucky I made that putt on the par five because was going pretty far past the hole. That was just a little bonus and got the second nine rolling when I played really good." Paul Dunne: "I'm pretty pleased. I find the greens quite tricky to read out there especially on the front nine, so it was nice to get a couple of putts go in on the back nine and give myself a climb up the leaderboard. "Our front nine was quite windy and that just makes it trickier to putt than anything else. This golf course with the rough the way it is - kind of patchy - you can get away with some bad shots but it's just hard to make the five, six-footers for par if you get out of position. "Then on the back nine the wind died a little bit but the rain came in so it was a tale of two halves. I'd rather the little bit of rain and calm conditions because it makes the greens a little more puttable for me. "The greens aren't that big, you've got to drive the ball reasonably well, but you can get away with some bad ones. It's a matter of trying to take advantage of the short irons when you get them because it's pretty easy to just one-hop over greens or be just a little bit short and get a little bit out of position. “On the first nine holes I was playing pretty nicely but I wasn’t giving myself chances close enough. Then I hit a couple of shots a little bit closer on the back nine when I got wedges in my hand. And it was nice to finish with an eagle. I thought the drive was borderline carrying, so it was nice to take it over and then take advantage of it." Marc Warren: “It was good. Finished with three birdies in a row so it kind of makes it look a little bit better obviously. Overall, it was really solid tee to green. I putted really well today— pace was really good. The putts that missed I didn’t leave myself much to do, and the good putts always looked like they had a chance of going in. “It’s tricky, it was really cold this morning. It was kind of warming up the first couple holes and then the wind changed direction slightly, picked up a bit, and it got really cold, so the woolly hats and mitts were back out again. It warmed up about the back nine and it was a nice finish, so it didn’t seem too bad. 75 T Aiken (SAf) , A Chesters (Eng) , R McEvoy (Eng) , T Pulkkanen (Finland) , A Sullivan (Eng) , D Im (USA) , C Koepka (USA) , A Del Rey(am) (Spn).